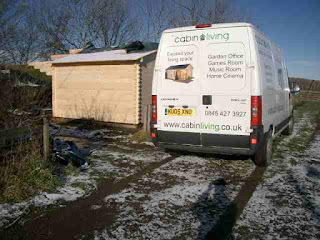 Log Cabin Installation of the month "The Shed"
In this feature we will be looking at one of our installations each month. Hopefully this will give a bit more insight into the choices you may have to make as part of your own installation. 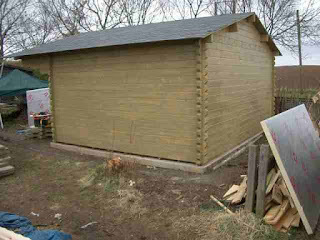 Here we have a fairly comprehensive installation we recently completed which Alex, our customer likes to call "The Shed". To start we have the base assembly. Ofcourse this is an option we quote for and the prices for this are shown on every product page. 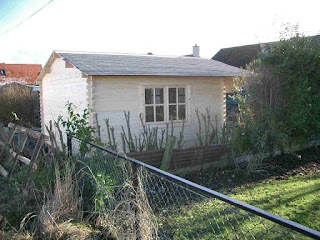 You may choose to build a base yourself or there may already be a base suitable. 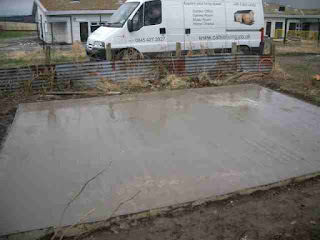 Typically we lay a 100mm thick concrete base slightly bigger than the foundation of the log cabin. Alternatives are slabs or a substantial decking frame using not less than 4 x 2 timber. 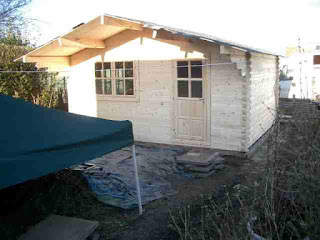 Normally completed in a day and left to set we are now ready for the log cabin. 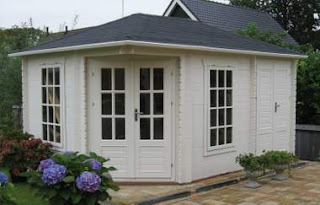 This is a 5m x 4m Plymouth log cabin chosen primarily for its wall thickness of 68mm but also for its large open space and suitable window positions. The side windows and door position are reversible on this model. It was a snowy start this morning. Time to finish the roof boards and fix down the biitumen tiles. 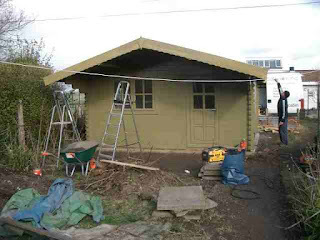 On a cabin this size you are likely to take at least 3 hours to fit the tiles if working on your own. There is a choice of bitumen roof tiles with most models in our range. Another option you may consider is a green roof system using sedum to create a living roof though it would be approximately 5 times the cost of bitumen tile roof. We have sourced a supplier of green roof systems and can quote for this on request. 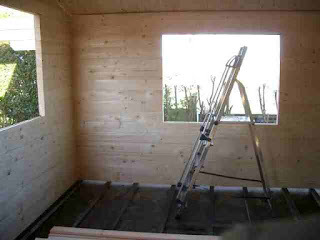 Here we see an internal shot prior to window installation. 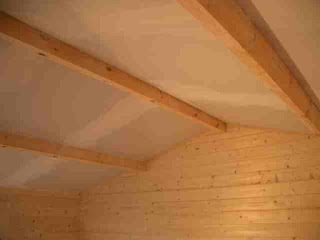 You may be able to make out the pressure treated floor beams to which we attach damp proof course as standard in all our log cabin installations. Biutmen tiles still need trimming and wooden side trims are yet to be fitted but this will only be done once we have painted the log cabin. Door and windows ae now fixed in place so we are now watertight and ready to start working on the interior. 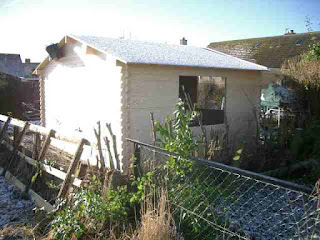 Typical options are roof and floor insulation and obviously an essential to most shed workers is electrical connection and probably broadband networking. 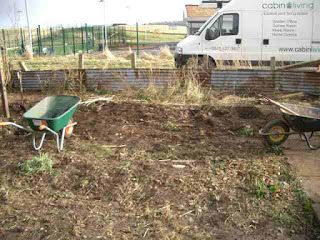 Here we see the start of groundwork for the network and electrical cabling. We will be installing armoured cable for the elctrics, network cable plus an additional cable for telephone. 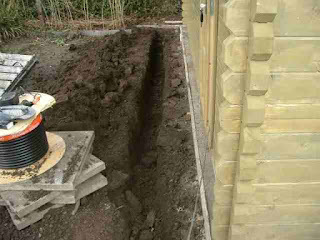 Network cables are laid in conduit for protection. Typically we run network cables a recommended 100mm or more away from electrical cable. The picture below shows the route of the network cable which avoids cables being laid near to the electrical ring circuit inside the cabin. You should be able to make out the armoured cable for the electrics. You will get a safety certificate on completion of all electrical work. 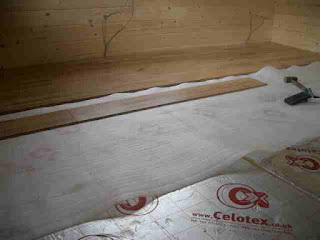 Floor insulation (50mm Celotex) is added above the standard 19mm tongue and groove flooring and then most frequently laminate flooring is added above that. Laminate flooring has the advantage of being easy to maintain. We supply a range of laminate through our Magnet Trade Account. Some customers prefer carpet and therefore fitting plywood of either 12 or 18mm is an option ready for underlay and carpet to be added. Most log cabins will accommodate the insulation above the standard floor but if you prefer it is possible to increase the size of the floor joists so that insulation can be placed on a sub floor beneath the standard floor. Obviously this would increase the overall height of the log cabin. Now we see the quality of finish obtained with a second coat of wood protection. 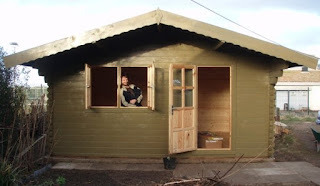 A cabin of this size does require 4 x 2.5L tins which is £180 without the labour. 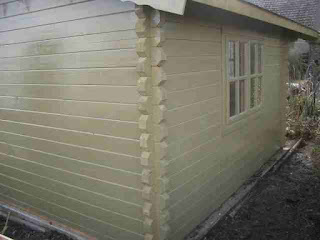 This may seem expensive but it is worth spending the money on a high quality finish to ensure your log cabin is well protected. This finish should be sufficient for 5 years of protection at which point another coat can be re-applied. 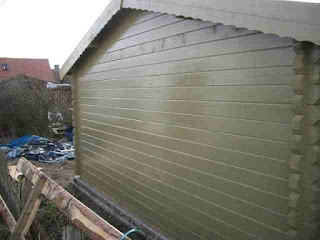 As a guide if you were painting this size of shed on your own it would take you two full days to paint. Close to completion a little painting still to do and the paving to go back. And finally... paving in place, completed painting and installed a happy customer. One of the neighbours said "I love your new house" in typically dry Scottish humour and with another 20 square metres of living space it certainly has made a difference to the amount of living space available. 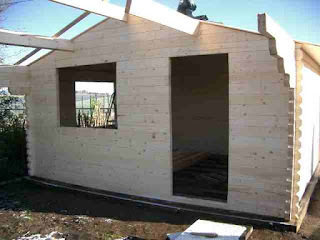 Bespoke log cabins may hold the answer to new planning regulations. As part of our continued efforts to provide the customer with what they want we are offering bespoke log cabins based on any design you choose. Whether it is based on an existing log cabin or a sketch on the back of an envelope we can help you turn it into a reality. 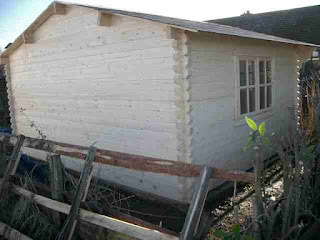 Below is an example of a standard carlisle log cabin from our main range. 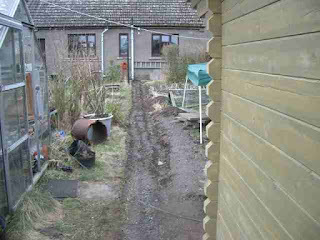 However we have a customer requiring a bigger sized version so we suggested the bespoke log cabin route. We have the option to add extra windows, change the size, change the wall thickness and reduce the ridge height to meet new planning rules. 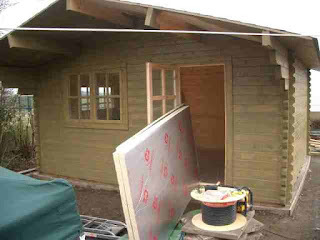 As standard our bespoke log cabins are made with 44mm walls and supplied with double glazed windows and doors. 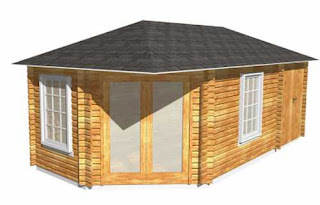 As part of the process of ordering your cabin you will receive CAD drawings of your very own log cabin plans for your perusal to enable you to provide feedback prior to manufacture. The best bit is we can often match the prices of similar sized models from our standard range and the lead time for delivery is also typically within 4 weeks of final approval.